The Atlantic Salmon Federation (ASF) and The Conservation Fund Freshwater Institute (TCFFI) are jointly hosting an international land-based, closed-containment aquaculture workshop on April 29-30 in Chamcook, New Brunswick. Overview of a closed containment salmon grow-out tank at The ConservationFund's Freshater Iinstitute in West Vifginia. SUBJECT: The Atlantic Salmon Federation (ASF) and The Conservation Fund Freshwater Institute (TCFFI), are jointly hosting an international land-based, closed-containment aquaculture workshop on April 29-30 in Chamcook, New Brunswick. Presenters will include Chief Bill Cranmer, from the Namgis First Nation Closed-Containment Project in British Columbia. Chief Cranmer will be speaking about his experience with growing Atlantic salmon on land. His attendance follows a major announcement earlier this week regarding the first harvest of land-raised KUTERRA salmon which is being sold through Safeway stores across British Columbia and Alberta. There will be updates on several ongoing closed-containment projects including presentations from Steve Summerfelt, from The Conservation Fund Freshwater Institute in West Virginia. Expertise will be available in all aspects of land based, closed-containment systems including start-up costs and construction, fish health and welfare, organic and sustainability rankings and marketing and promotion. More than 80 participants are registered from across Canada, the United States and Europe. 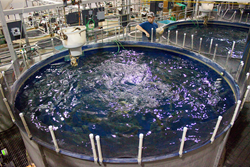 Samples of Atlantic salmon grown in a land based, closed-containment facility will be available. NOTE: All sessions are open to media. TIME: Approx. 8 am-5:30 pm, both days. Schedule may be subject to change. LOCATION: Wild Salmon Nature Centre (formerly known as Atlantic Salmon Interpretive Centre), 24 Chamcook Lake Road #1, Chamcook, New Brunswick. The centre is located on a nearby, but separate, road from the one leading to the International Headquarters for the Atlantic Salmon Federation. It will be clearly marked. Parking is available on site. INVITEES: All journalists, broadcasters, photographers, food writers, videographers and other media representatives. Please contact Holly Johnson at (506)529-1033 to make arrangements for media passes. Agendas are available in advance. Please email requests to hjohnson(at)asf(dot)ca.